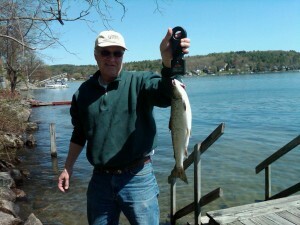 Lake Winnipesaukee Salmon Fishing - Have you caught one!!! Lake Winnipesaukee holds some of the best Salmon, Lake trout and Rainbow trout fishing around. With 42,000 acres to fish where are the fish today.You can travel all over the lake ( channel 12 on VHF will help ) but I am not much for long trips searching for the fish schools. I stick to Meredith Bay and know where the fish should be, that's should be. Some days I will catch 4-5 fish in the 2 hours I am out on the water and other days it was a nice boat ride. If you are new to the lake you might want to go out with one of the charters to learn the ropes or stop into one of the local bait shops and ask a few questions, buy the latest lure or gadget. I have a couple of favorite web sites I visit for information one is a forum with a message board and it also gives some of the charter captains information. http://www.fishlakewinni.com/ and the local bait shop in Meredith, they are friendly and informative along with the best lures or flies for the day along with the best accessories and repair http://www.ajsbaitandtackle.com/ . Some questions you need answered are what are the fish biting on ( Sunny days - Cloudy days ) and more importantly how deep are they. If the fish are down in the thermocline at 40 feet and your fishing at 10 feet you guessed your day will be a boat ride. Some to do's while you are on the water, change your hooks over to single hooks from trebles for easy hook removal and use a rubber net. If you fall in love with our lake and you would like to enjoy it call Lady of the Lake Realty at 1-888-737-5550 or e-mail at info@nhlakesrealty.com or visit our website to view lake homes in New Hampshire at www.nhlakesrealty.com or www.lakeorskirealestate.com Contact us today? ?